Whether you are extruding plastic for screwdriver handles or molding, a durable state-of-the-art extrusion control system is needed. Upgrading to one of these electronic control systems allows for better accuracy and consistency throughout a high volume manufacturing process. Electronic Control Corporation was hired to design, build and test a plastic extrusion control system for a large plastics manufacturer in the United States. This was to replace an older and far less efficient control system for the process. ECC-Automation started the upgrade process by first identifying the client’s requirements for the upgraded extrusion control system. The system was then designed, evaluated for how the new system will integrate into the client’s building, and thoroughly tested prior to on-site delivery and setup. Keeping the temperature consistent is the key to a successful plastic process that produces quality products. Starting in a liquid state, the plastic is then heated & pressurized out through the mold. Once in the mold, the plastic is then cooled down to form. So while the temperature is changed during different phases of the process, it must be controlled accurately throughout the system at any given phase. The ECC extrusion control panel contactors were hooked up to the thermocouples and resistive temperature detectors at temperature stations throughout the manufacturing facility, to closely control and monitor consistency during the entire process. Solid State Relays or SSCRs were used for durability, and according to the established UL508A requirements for short circuit current ratings or SCCRs. Other key components on the plastic extrusion control panel were two fuses, that were installed on separate circuits to protect each heater from overloading. 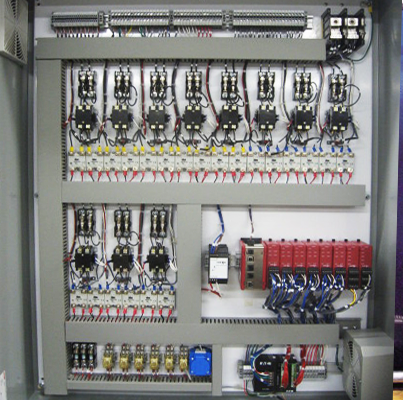 The red junctions on the extrusion control panel are PLCS (see image), programmed in-house by Electronic Control Corporation. In this case, relay logic was developed, rather than using function blocks during the programming phase. Along with a powerful main processor, all individual units on this electronic control system contain expandable input/output for scalability. All plastic manufacturers apply a policy for replacing electronic control systems, depending on the application. Some applications, like sanitary process in pharmaceutical and food, require a much shorter timeline. Others, such as plastic extruders in this case, can apply a longer replacement schedule for components. The new extrusion control panel was interfaced with the plastic manufacturer’s Building Management System (BMS) to help increase monitoring efficiency throughout the entire manufacturing process. The focus of this project was all about controlling the heat at any given point in the process. So having a state-of-the-art control panel engineered to replace the older was key to gaining better accuracy and consistency. In addition, the efficiency of control and BMS monitoring was improved throughout the entire extrusion process.